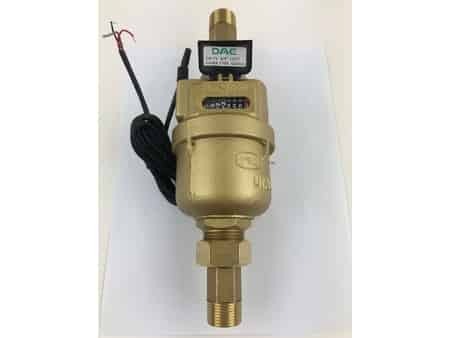 Can be installed in any position, vertically or horizontally, dial facing upward or downward, water flowing downward or upward. 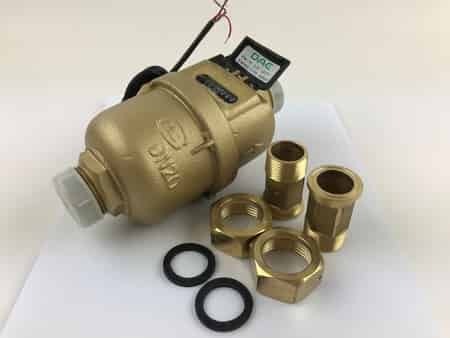 With internal non-return valve. 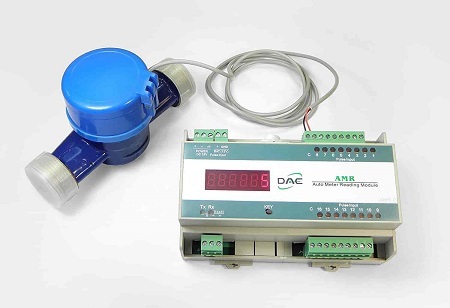 Cloud Metering available with DAE CC2030 Gateway. 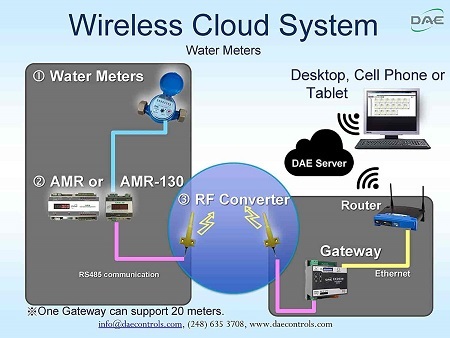 CC2030 gateway will get the water consumptions from DAE AMR (Auto Meter Reading Module with RS485 communication for 16 water meters with Pulse Output) or DAE AMR130 (for 1 meter) and send them to the cloud (DAE server) through Ethernet. 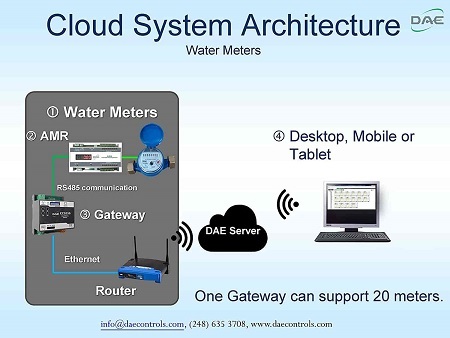 With PC or cell phone or tablet, the building owners or property managers will therefore be able to get access to real time data as well as the monthly water consumption and billing reports to their tenants. Most of our customers will be able to receive their items in 3 business days (Continental US). If you order by 4:30pm Eastern Time Monday through Friday and by 11am Saturday, we shall deliver in the same day. Mount: vertically or horizontally, dial facing upward or downward, water flowing downward or upward. Item dimension: 6.5" length, 3.5" diameter. weight: 3 lb, 9.3 once. Maximum Reading: 9,999,999.9 Gallons. The last digit is one tenth gallons (*0.1 gallons). 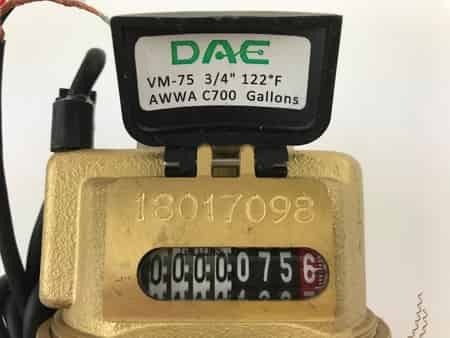 The reading in 2nd picture of the listing is 75.6 gallons. 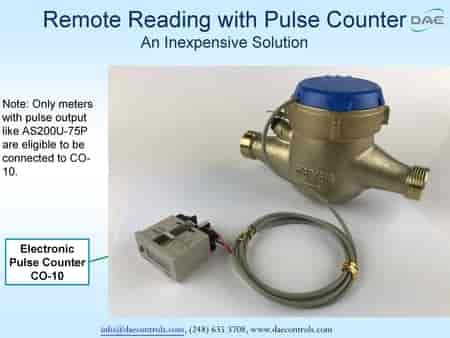 DAE VM-75P 5/8"*3/4" meter is not a meter with a 5/8" inlet and a 3/4" outlet. It is with 3/4" NPT couplings for both 3/4" inlet and 3/4" outlet.